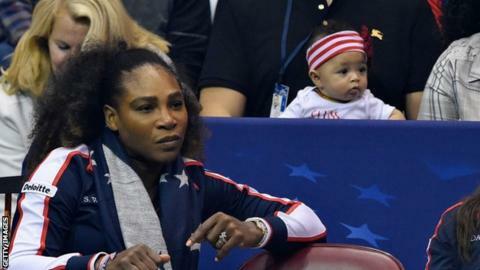 Seeding rules in women's tennis are a "kind of punishment" for players such as Serena Williams after maternity leave and "should be changed", says the tournament director of the Miami Open. James Blake, a former world number four, was speaking after Williams, 36, was drawn against Naomi Osaka in the opening round of this week's event. She is unseeded after taking 13 months off to have her first child. "It makes sense to protect someone who goes on maternity leave," said Blake. "The rules should help her get the benefit of an easier draw and a better path. "These kind of things shouldn't happen. She has won this title so many times that she needs protection. "It's not as if she left because of injury and lost her passion for the game. She had a kid, which we should all be celebrating, so when she comes back there should be a grace period where she can still be seeded." Williams, a 23-time Grand Slam singles winner, has no official ranking, which means she cannot be seeded for WTA events. However, she can gain entry to eight tournaments in 12 months - including two Grand Slams - with her protected world number one ranking. Her comeback in Indian Wells at the start of the month ended in the third round against sister Venus - their earliest meeting since the second round of the Australian Open in 1998. An eight-time winner in Miami, she is now preparing to face 20-year-old Osaka, who won the Indian Wells title at the weekend but is not seeded either. Special seedings were sometimes applied to players returning from long lay-offs, but that rule was scrapped by the Women's Tennis Association (WTA). The WTA has, however, amended its rules in the past year so that players who are absent through pregnancy are "aligned" with those missing through long-term injury. "This provides for a player to return with a protected ranking but does not allow for a player to be seeded," WTA chief Steve Simon explained. "When reviewing these rules the players have traditionally expressed they do not feel that a player coming back from a long-term lay-off, for any reason, should be allowed to be seeded," he told the New York Times last week. However, he added he expected the rules to be "further reviewed". "We are very supportive of those players returning from pregnancy to the Tour."